Life of a Catholic Librarian: Happy Thanksgiving week, and Advent plans! Hi all! I am home on vacation for the entire WEEK. The children are in school, I am in my pj's drinking coffee and crocheting non-stop, and I am downright blissful about it. I realized this weekend that this semester really started to eat away at my spirit. I lost my passion for my hobbies and the creative endeavors that I derive satisfaction in. I felt down and downtrodden a good portion of the time, and on the whole I was just beleaguered. Over the course of the semester, I held onto my love of writing via our Autumn Prayer Journal Curators/INSPIRE series, and in November, my choreography endeavors and holiday crafting revived that dormant creativity within me just begging to come alive again. It feels really, really good. I am excitedly planning several things. First, this winter, I am planning lots of new dance and crafting stuff. Stay tuned for all sorts of posts on those this upcoming season! 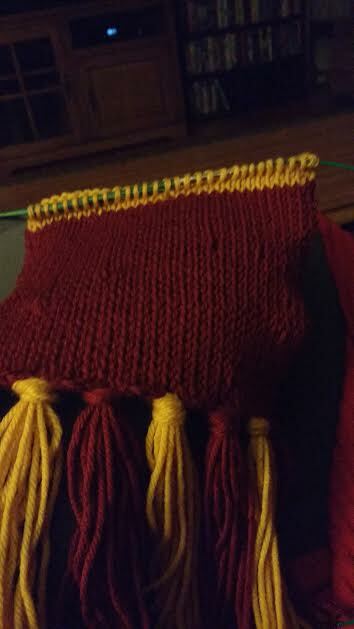 Gryffindor scarf for Henry! The pattern is available for free here. It's Tunisian crochet, which is a totally new craft for me. You use a crochet hook to pull up stitches in a long row, then do a backwards pass to finish them off all at the same time. 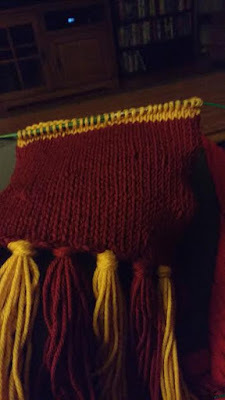 This uses the Tunisian Knit Stitch, which makes the front side look just like stockinette knitting, but provides a much thicker fabric on the back. It's fascinating! And on the dance front...my mind is completely awhirl. I'm taking a choreography workshop at my studio that starts in January, the spring hafla is in April, and I'm contemplating going to an out-of-town workshop with a well-known dancer in June. Just thinking about it all makes me feel so happy. 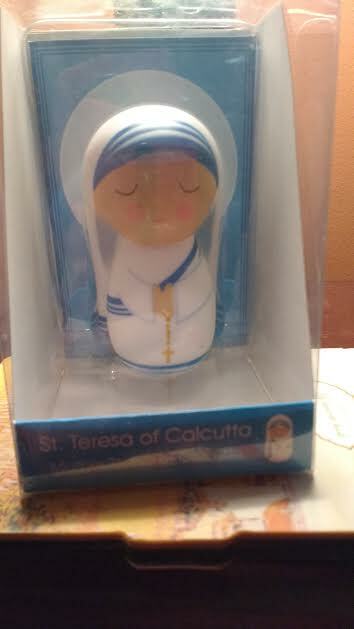 Henry is getting St. Dominic Savio this year, he is still on his way. And I'm thinking that we'll definitely do an Advent series right here on this blog. I'm calling it "Anticipating Joy," and each week we'll have a theme and write in to each other with an anecdote about our week related to that theme. I'm going to be using Advent with St. Teresa of Calcutta, but I also have a new prayer journal and an additional devotional, and my theme could be inspired from any one of these. Your anecdote can be related to something you found in a devotional, or just something from your life generally. I'll probably post them on Wednesdays, I think that mid-week slot. Sound like a plan? We'll begin next week! What are your plans for Thanksgiving, dear readers? Mike and I are hosting our parents and my grandmother, so we're in full-on cooking and house cleaning mode. How about you? Write in and tell me all about it! And I'll be with you again next week. Until then! Yay Gryffindor! 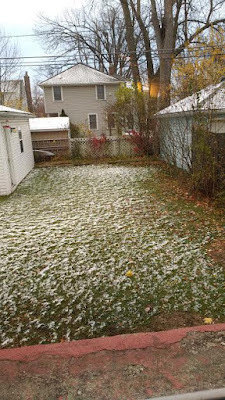 That's my house too. Anticipating Joy is a perfect name for an Advent series. Sums up Advent in two words. The youth group at my parish sells devotionals for Advent and Lent and I'm planning to use that one this year. Thanksgiving is at my parents this year. Since most of the people coming are adults we split up the dishes between us and everyone is bringing something (or the ingredients to cook something at my parents house). That way my parents don't have to cook but if my mom want to take a nap her bed is just down the hall. I'm heading home tomorrow afternoon for the rest of the week. I am looking forward to it very much. We're having Thanksgiving with dad's family this year. My aunt is hosting. I'm excited to see all the cousins, especially my cousin who lives in NY. She's bringing the babies (14 mos & 2 mos) with her! So many babies! There haven't been this many babies at a Campbell holiday gathering in almost 6 years! Hi Melanie! I'm so glad you like the title of the Advent series, and will be participating! Sounds like a great idea to use your parish devotional. We do a similar thing on Thanksgving. We're hosting and are doing the turkey and stuffing, but our moms help out by bringing side dishes. :)Happy Thanksgiving! Hi dear one Sam! That sounds like a lovely Thanksgiving indeed! And so fun with all the little ones. <3 As a student, I always loved the Thanksgiving break. So very needed at this point of the fall semester.